Which is where things get tricky. Hushpuppy recipes are about as varied as the folklore surrounding their background. Although the dough is essentially a mixture of cornmeal, flour, milk, eggs and leavener, there are all sorts of things folks like to add to their batter: minced onion, scallions, sugar, cayenne, corn, chile peppers, bacon, Tabasco — the possibilities, while not endless, certainly involve more math than I feel like doing at the moment. And all those possibilities make it difficult to create a hushpuppy that tastes just like home, which is why my mama sometimes tucks a small bag of House Autry Hushpuppy Mix into her monthly care packages. She doesn’t need to do that anymore. Because several months ago I bought an amazing cookbook called Fish Without a Doubt that suggests yet another addition to the hushpuppy party: scallops. I adore scallops with their sweet, delicate flavor and their melt-in-your-mouth tenderness and their subtle saltwater brininess, but scallops come from far, far away and they cost an arm and a leg. Whitefish, on the other hand, comes right out of Lake Michigan and is available — freshly caught — twice a week at the farmers market for a mere $5 a pound. 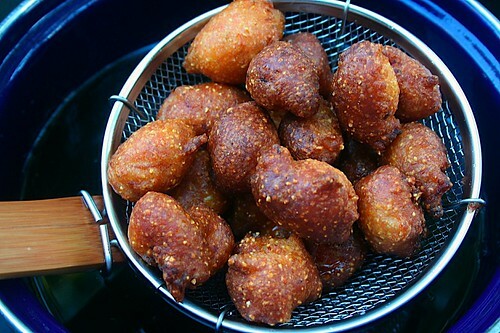 It has the same sweetness and tenderness, making it a perfect candidate for nestling inside a bit of fried dough. And seriously, I may never make plain old hushpuppies again. Wait, that’s crazy talk; of course I’ll make plain old hushpuppies again. But the way the hearty cornmeal dough puffs up around the the sweet little chunks of whitefish in a sort of Southern-Midwestern fusion is really pretty fantastic. Pretty fantastic and pretty damn tasty. So fantastic and tasty that the next time Chris requests beer battered whitefish and hushpuppies for dinner — which shouldn’t be long now — I’ll just skip a few steps and fry the fish inside the hushpuppies. With maybe some slaw on the side. For nutrition or whatever. The original recipe, as I mentioned, calls for bay scallops (the little teeny ones). You could also substitute rock (teeny) shrimp or sea scallops cut into smaller pieces. 1) Whisk the half-and-half or milk and vinegar together in a measuring cup. Set aside while you get everything else ready. 2) Whisk the dry ingredients together in a large bowl with a generous does of white pepper. 3) Heat at least 3 inches of oil to 375°F over medium-high heat in a wide, deep pot. Set a rack over a baking sheet near the stove. 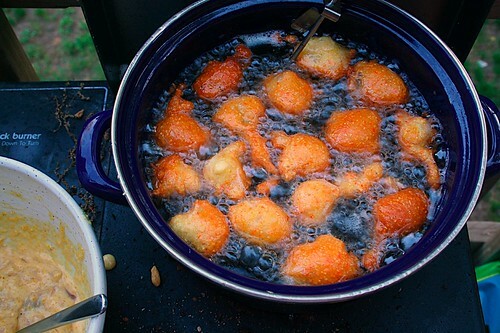 4) When the oil is hot, add the half-and-half or milk and the egg to the dry ingredients and stir until just combined. Fold in the whitefish chunks. 5) Use a teaspoon to lift the whitefish chunks out one by one and drop them into the hot oil. Don’t crowd the pot. Turn the heat up to high and monitor the temperature. Fry until golden, one to two minutes, rotating as they fry. Lift the hushpuppies out with a slotted spoon and drain briefly on the rack. Serve immediately, or hold in a warm (200°F) if you have to fry in batches. This entry was posted on June 28, 2009 by Megan @ When Harry Met Salad. It was filed under fish & shellfish and was tagged with homemade, hushpuppies, whitefish. Holy jeebus those look good. Will you mail me some? 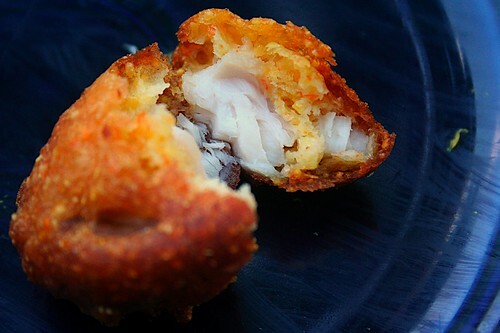 I’ve never experienced nor seen a hushpuppy before. They look yummy. Do you eat these with a sauce at all? Oh MAN that looks delicious. I gotta tell you, I have never made good hush puppies. Maybe I just didn’t have the right recipe. That fish looks remarkably moist and tender inside of that crisp shell. This brings me right back to my North Carolina days, where hushpuppies are uber popular! We just had our first authentic Southern hushpuppies with honey butter at Sara J’s in Myrtle Beach, South Carolina. They were HEAVEN on earth – I ate so many that I didn’t have room for my real dinner. those look ridiculously good. 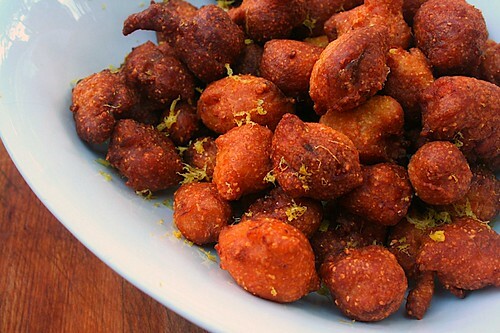 its hard to find hush puppies in san francisco too, but maybe now i can try making some. thanks for the recipe! 1. Is that a deep fryer? Do you have a deep fryer? Oh, girl. 2. Hushpuppies, much like falafel, are excellent when warm and freshly made, and are nasty once they get cold. Why is that? 3. Caliente Gimlet: Throw some simple syrup in a blender with a handful of cilantro and a good-sized chunk of raw jalapeno. Blend until liquified. Strain if you are fancy. Throw about 1/2 oz. of the syrup in a glass with gin (or vodka) and ice and some fresh lime. You can shake with ice and strain if you like it straight up. Nerissa – Oh you poor thing! Some people eat them with butter, some dip them in honey, and I think some people might dip them in tartar sauce or even cocktail sauce. I just like them plain. Joe – Yeah, I still haven’t had much luck with regular old hushpuppies, except from the bag of mix. Susan – Yep, it was North Carolina hushpuppies I was going for. Thanks for your visit. Jenna – We actually ate these for dinner, without even pretending that we were just snacking. Lola – You’re welcome! I hope they work out. Kristi – You can’t seriously expect me to know what they serve at Red Lobster, right? :-) Chances are that nothing is supposed to taste like it tastes at Red Lobster. 1) No. It is merely a pot full of oil on the side burner of our grill. 2) I have been known to eat leftover hushpuppies, cold from the fridge, for breakfast. But that only works with certain hushpuppies. I think it must have something to do with the oil. 3) Wow. I think I’m afraid to try that. But I bet Chris would like it. Thanks. I just happily stumbled upon your lovely blog in a search for a lavender cookie recipe. Ooh la la. Then I clicked on over to whitefish hushpuppies. Dreamy. I discovered that you’re in northern Michigan. Me too! I wonder if I know you and I don’t know that I know you. Ha! Your site is fantastic! Generally as i visit blogs, I merely discovered crap, but on this occasion I became really surprised whenever i got your website containing brilliant information. Thanks mate and bare this brilliant effort up.But from the very next time make an effort to make longer posts, its brilliant which you believed to the idea but more elaborations will be much appreciated.